The Lola-Ford T97/30 was presented on 20 February at London's Hilton Hotel. Team founder Eric Broadley spoke optimistic about the creation with the aim to get some points in its initial year and get the world championship in 4 years, exactly the term of their title sponsor Mastercard: "We have the experience, the commitment and the desire to succeed in F1. We have knowledge from our composites shop, our engineers cross over from both programs and the wind tunnel work we have done at Cranfield with the Indycar is directly applicable to F1. We have basically worked at lightening components down to F1 needs. We have taken the best ideas from specialists in the wind tunnel, aerodynamics, vehicle dynamics and the like to produce the final machine." In reality though, the car was only finished the night before the launch and had been developed quickly as the team were only able to start with the design on 5 November. Chris Murphy was credited for the design on which he most likely did not have much influence on. The team itself was being funded by Mastercard, a company that manages credit cars for approximately 380 million car holders. The base idea was to fund the team membership of an exclusive club of Mastercard holders with access to special privileges. However, it appeared that some of the financial institutions did not want to participate in the project for various reasons. At the first race, in Melbourne it quickly showed how few development time went into the chassis. The car was a huge 13 seconds off the pace during qualifying and therefore well out of the 107% rule. The rushed development meant that the cars were actually never tested in a wind tunnel. Both drivers therefore suffered an overall lack of downforce and, on top of that small gremlins with the gearbox. Additionally, the cars only completed a short shakedown before the first GP, mainly to see if the Ford Zetec-R V8 engine was up to it. 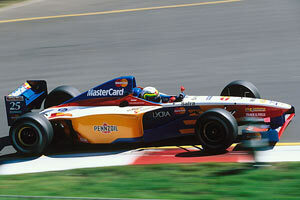 Lola's plans to design its own engines had run into delays and did not make it for the 1997 car. Just two weeks after Melbourne, the team decided to withdraw from F1 for "financial and technical" reasons. It appears that Lola had financed the project initially before the Mastercard money would come in. As that was delayed and since the project had already cost more than planned, the team decided to quit in order to preserve Lola itself.